East Texas Home Health Fraud Defense Attorneys - Oberheiden, P.C. Over the last several years, the Department of Justice (DOJ) has increasingly targeted home healthcare providers and hospice services. Consequently, investigations into hospice fraud are on the rise across the country, especially in East Texas. Such investigations may be initiated by the Federal Bureau of Investigation (FBI), the Drug Enforcement Agency (DEA), the Department of Health and Human Services (DHHS), or the Office of the Inspector General (OIG). While in the past such investigations were likely to be civil in nature and merely seek recoupment and fines, the recent trend among such agencies is to pursue incarceration of those defendants who are convicted. Our years of experience in criminal defense and healthcare law convince us that this focus on hospice fraud will continue indefinitely. Healthcare fraud cases focused on hospices allege serious criminal misconduct such as billing for medically unnecessary tests or medicines; falsifying records; paying kickbacks; providing false medical certifications or missing medical certifications; billing for patients who are deceased; and failing to release patients from hospice care once they are no longer terminal. At Oberheiden, P.C., our experienced team of defense counsel represent clients in East Texas and beyond accused of healthcare fraud, including those involved in providing home healthcare services. The strength of our firm is based on three prongs: our industry knowledge, our government experience, and our ability to keep investigations from becoming criminal. Industry Knowledge. Our experienced team of attorneys is intimately familiar with the complexities of the home healthcare and hospice industries. We use our industry knowledge to both advise clients on how to structure their healthcare business legally so as to avoid investigations and also to defend them in the case that an investigation is initiated against them. If you have been accused of or investigated for healthcare fraud, you need attorneys that know how the hospice industry works and how to get cases dismissed. You do not have the time to waste on an inexperienced attorney who does not understand your industry or the nuances of billing and certifications. Government Experience. At Oberheiden, P.C., our team approach is one of our greatest strengths. Every one of our cases is handled by former healthcare prosecutors from the Department of Justice, who have a collective wealth of knowledge and insight into the government’s strategy. 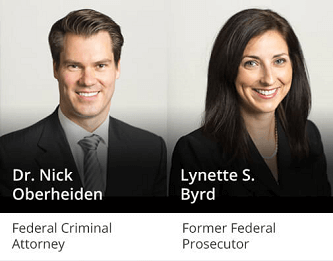 Together with our founding partner, Dr. Nick Oberheiden, our team of former prosecutors addresses each of our clients’ cases personally. Our clients benefit from full service representation that allows them unfettered access to senior attorneys. Civil, not Criminal. Not all governmental investigations into home healthcare fraud result in criminal penalties. Therefore, helping our clients avoid criminal charges is our main priority when combatting a fraud investigation. More than once, our lawyers have successfully argued to the government that abnormalities in our clients’ practices, including those involving large-scale operations, were merely accidental oversights as opposed to intentional fraud. Our use of this approach has been effective in helping our clients conclude investigations with a confidential settlement involving a monetary payment, rather than the criminal prosecution of the individuals deemed responsible. We have successfully defended individual and corporate healthcare providers in OIG, DEA, FDA, DHHS, and FBI investigations across the country and specifically in East Texas. Give us a call today to find out how our team of former federal healthcare prosecutors and experienced defense counsel will assess your case. All initial consultations are free and confidential. Longer you wait to obtain legal representation, the more time the government has to build its case. Call today to talk to Nick or Lynette of Oberheiden, P.C. We also answer calls on weekends.